Hurt in an auto accident? You are likely entitled to more than what the insurance company offers. Call us today. Whether you’re driving your kids to school, running errands, or just enjoying a Sunday drive, anytime you get behind the wheel, your drive has the potential to be life-changing. If another driver takes his or her eyes off the road and/or their hands off the wheel for even a second, that negligence can cause serious injuries or even death. If you or someone you love has been injured in a Nashville car crash, you aren’t alone. More than 70,000 people were injured or killed in Tennessee car wrecks in 2015 alone. Because car wrecks can have devastating consequences physically, emotionally, and financially, it’s important to have a dedicated legal team by your side to help you get justice. How Do Car Crashes Happen? There are a variety of causes of auto accidents. In some instances, the negligence of another driver causes a motor vehicle accident. Things like driving under the influence of drugs or alcohol, distracted driving, or reckless driving are all ways drivers can cause collisions. Things like driving under the influence or texting while driving are illegal in the state of Tennessee, but many drivers chose to blatantly ignore these laws and put other motorists at risk. Sometimes car wrecks are caused by poor weather or road conditions. Icy roads or fog can greatly increase the likelihood of a motor vehicle accident. If driving in poor conditions, drivers should exercise extra caution. Motorists who drive carelessly in poor conditions can cause devastating car accidents. A driver or a passenger can sustain a range of injuries from an auto accident. Less severe injuries include abrasions or bruises, but more severe injuries include broken bones, deep lacerations, traumatic brain injuries, and back, neck, or spinal cord injuries. Traumatic brain injuries (TBIs) can have a host of symptoms and often lead to permanent brain damage requiring lifelong care. Neck, back, and spinal cord injuries can cause permanent paralysis in the body, including paraplegia and quadriplegia. In addition to debilitating injuries, car accidents also impose financial burdens on victims and their families. The cost of emergency medical treatment, necessary physical therapy, or specialty medical equipment can quickly become overwhelming, particularly if the victim suffers an injury that prevents him or her from being able to return to work. Rear-ended – This type of collision occurs when the front end of another vehicle comes in contact with the rear end of your vehicle. Neck and back injuries are common following this type of accident. 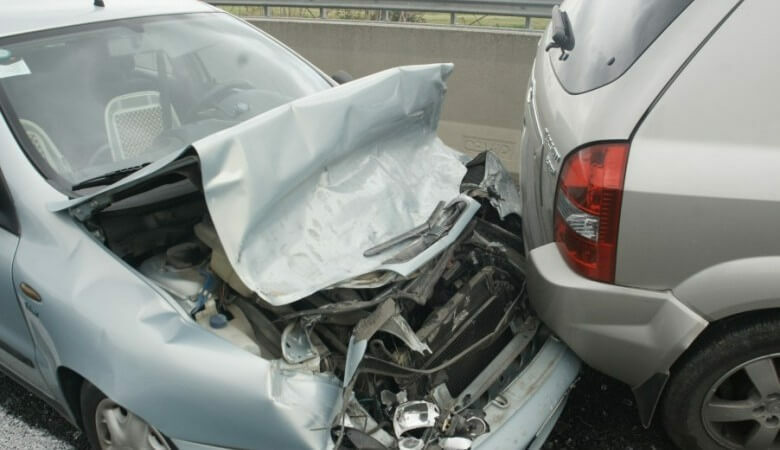 T-bone – Also known as right-angle collisions, these car accidents occurs when the front end of another vehicle collides with the side of your vehicle. T-bone collisions can occur when reckless drivers ignore traffic lights or signs. Sideswipe – These car accidents most often occur where two lanes merge or when another driver is distracted, causing the sides of two cars traveling in the same direction to collide. Head-on – One of the most serious types of roadway accidents, head-on collisions occur when the front ends of two cars crash into each other. This type of wreck can cause devastating injuries. Rollover – Under certain circumstances, vehicles like SUVs with higher centers of gravity can tip and turn over onto their sides or roofs. When the compartment holding the passenger is not strong enough, it can collapse in on the driver and/or rider, causing catastrophic personal injuries. At high velocities, cars can even rollover several times. This type of crash has the highest fatality rate. Medical Expenses – If you suffered any injuries in your accident, you likely have hefty medical bills. Seeking compensation for medical expenses can cover emergency treatment, surgeries, medications, hospital stays, specialized medical equipment, and physical therapy necessary to recover from your injuries. Property Damage – When your car sustains damage from a roadway collision, seeking compensation for property damage can not only pay for the needed physical vehicle repairs, but can often also cover the cost of the loss of property value to your vehicle. Pain and Suffering – Because injuries can be long lasting or completely permanent, victims can seek compensation not only for the pain experienced from acute post-accident injuries, but also for any future pain they may experience as a result of their injuries. Lost Income – If injuries sustained in a car collision cause victims to miss work, they can pursue compensation for lost wages incurred and for future lost wages related to their car accident injuries, including ongoing medical treatment and therapies. Emotional Pain and Suffering – Car wrecks can place a huge emotional toll on victims and their families. Compensation for emotional pain and suffering can be particularly relevant in the case of wrongful death, disfigurement, or permanent paralysis. Loss of Consortium – This type of compensation is available specifically to the spouse or other family members of the victim who suffered as a result of the car accident. Why Hire A Nashville Car Accident Lawyer? Most people who have been in a car crash have never dealt with a lawyer before. People often think insurance companies will cover all of their expenses and/or that hiring a lawyer just won’t do any good, but the reality is insurance carriers often provide lowball settlement offers and hiring an attorney may be your best course of action. Being represented by an experienced firm of personal injury trial lawyers means you have an entire legal team on your side to fight for your rightful compensation. The attorneys at Whitfield, Bryson & Mason work with industry experts and crash reconstruction specialists to build the strongest case to recover maximum available compensation. After you’ve been in a car accident, there may be many questions running through your mind. How much will my medical treatment cost? Will I be able to return to work? How will I provide for my family? The attorneys at Whitfield, Bryson & Mason can analyze the facts of your case and help determine the best legal course of action for your car accident claims. Contact us today for a free consultation. Contact us today for a free consultation.